A tubby kitty has an increased risk of developing diabetes. Is kitty gulping down more water than usual? Does he have to pee all the time? These could be symptoms that he's developed diabetes. Just as in diabetes humans, feline diabetes requires careful management and diet restriction to keep his blood sugar levels healthy. Usually affecting middle-age or older cats, diabetes mellitus develops when Kitty either can't produce enough insulin or his body can't use what insulin he makes properly. Insulin is necessary for his body to process carbohydrates. If his blood sugar gets high, he'll start to pass sugar in his pee, which will lead to him drinking more water and urinating more often. 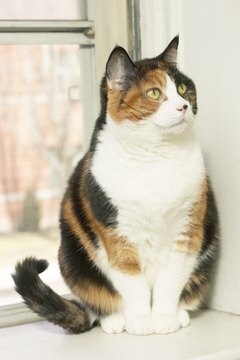 Because obesity affects sensitivity to insulin, a hefty kitty is more likely to develop diabetes. Keeping him on a strict diabetes-friendly diet will help keep his blood sugar level in a normal range. Once a human is diagnosed with diabetes, she has to avoid an overabundance of carbohydrates and sugar. The same goes for Kitty. Find a quality food that is formulated especially for a diabetic cat. One option is a low-calorie, high-protein and low-carb diet, which usually has the most success. Another option is a diet that is high in fiber and complex carbs, which slows digestion to regulate sugar levels. If you're on a budget, canned food might be a good alternative, because it usually has a higher protein-to-carb ratio than dry food does. Speak with your cat's vet about a recommended diet. Regulating how much your cat eats is as important as the type of food he eats. Free-feeding, or leaving a bowl of food out all day, isn't suggested. It can be difficult to monitor how much he is eating, and he might overeat. Instead, feed him two or three small meals throughout the day. Resist the urge to give him table scraps or sweet treats, as they could cause his blood sugar to skyrocket. If he's overweight, it can be hard to help him control his sugar. Speak with his vet about helping kitty shed a few pounds. Keeping your diabetic cat from overeating could eliminate the need for you to give him insulin injections. It is very important to look for the signs of hypoglycemia, or low blood sugar. Low blood sugar can cause kitty to be lethargic, have convulsions or fall into a coma. If his blood sugar becomes too low, it can be fatal. If kitty is unable to eat, rub some corn syrup on his gums to boost his sugar. If his sugar is low but he's able to swallow, offer him some of his regular food. If he's comatose, don't ever try to force feed him or put anything in his mouth. He should get immediate, emergency treatment. Find out where the nearest veterinary emergency center is, just in case. Speak with your cat's vet about checking his blood sugar at home. This is usually cheaper than having it done it at the vet's office, and it allows you to monitor his sugar daily. What Is Diabetes Insipidus in Dogs? Do Calico Cats Get More Diabetes?